Picture this ten Americans arrive in small Moroccan village: As they settle in Geoff, Eliana, Clemente, and Brandis begin a game of gin. Kayla becomes best friends with the little kids. Vanesia finds a way to get more apricot jam at tea time. Tori takes in mountain views while savoring a Coke Zero. Kate becomes friends with local women and begins baking bread and Sheldon as always finds a way to be the most relaxed human being alive. But I am getting ahead of myself. Since we last blogged we’ve visited two villages and a small town. We’ve lived with host families, talked with locals about immigration, created many more inside jokes, and as usual eaten far too much bread and mint tea. We began living in homestays in the beautiful town of Ait Ourir. There we partnered with Bridge Center. We got the opportunity to visit a high school, the city council, the women’s center, and the boldest of us attended a kick boxing class. For many, this was our favorite week thus far. Ait Ourir was filled with some amazing moments. Kayla scored a goal in a local soccer game and Tori shined in kick boxing class. Mente, as always, continued his search for Milka chocolate bars. My personal favorite moment was when Brandis opened up and finally played with KIDS! From Ait Ourir, we journeyed to the small mountain village of Anssa where we were greeted with the warmest of smiles and the warmest of bread. 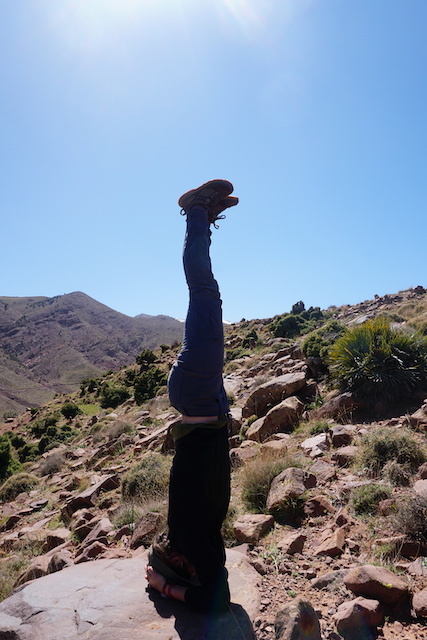 We spent our days in Anssa hiking, singing John Denver, and formulating how on earth we were going to stay awake for the typical 10 pm Moroccan dinner. Anssa taught me two main things: 1. 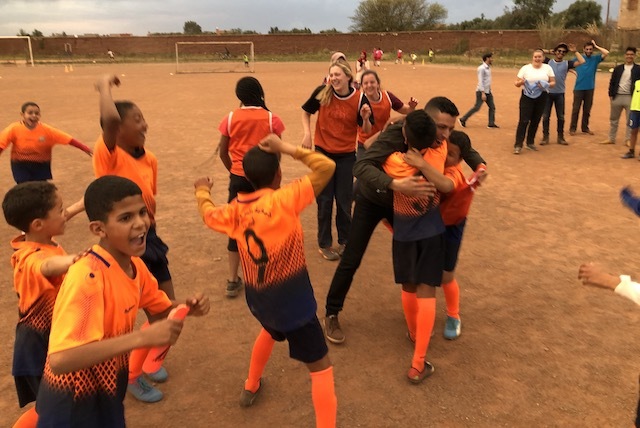 Moroccan time is very different than American time, meaning that a 1 hour village walk may be twenty minutes or four hours depending on how your guide feels. 2. You need no common language to enjoy the ending of Home Alone 2 (which we watched in a village kitchen with our host moms as they prepared dinner one night). Anssa also taught Eliana that holding random children may result in them peeing on you. I also must mentioned that I have never seen anything as majestic as Vanesia riding a mule up a mountain or seen as much grace as Geoff using a Jedi mind trick to hike up a hill. After Anssa, we packed thirteen people into a car and traveled to the village of Yagour in a manner that can only be described as very closely resembling the Indiana Jones ride at Disneyland. Our time in Yagour was splendid and was filled with more family style meals and 10 minute walks that turned into 3 hour excursions. The highlight of our short stay was our hike to visit petroglyphs and the snow/rain storm that tested our extremely limited wardrobes. As we approach our halfway mark, I can report that we are all happy and healthy and learning lots. Vanesia reports missing scented candles, Kayla misses ranch dressing, Mente misses his abuela’s lasagna, Brandis misses milkshakes, Tori misses the convenience of CVS, Eliana misses fried chicken, Geoff misses baseball, and me, I miss avocados. But we will survive and continue to thrive. Yagour Plait was just a tad windy. Jubilant celebrations are required after winning an amazing game. Mules are the preferred mode of transportation for Salaam. As if we all needed more confirmation that Kate is cooler than us. We made a group agreement that we would all be photogenic at all times. I can confirm Eliana is trying as hard as she can. How many human beings can you fit in one small car? We stopped at 13 but more are always welcome. I have never seen a bromance quite like Gemente. Or is it Cleoff? I have adopted a small sheep thank you for understanding.